my mom had to do was name three U.S. presidents to win a month of accordion lessons and the free use of an accordion.” She aced it and little Terry was on his way to accordion stardom. The music school not only taught how to play the accordion, it helped students hone their skills in the art of performance. “They were always big on contests and lots of performances at places like Sharpstown Mall. It was great fun,” Terry said. By the time Terry was playing gigs at Bavarian Gardens in the Heights and Astroworld, he was having a blast with his music. And once again, one of those random moments of fate happened. “Friend and band leader at the Bavarian Gardens, Kevin Hatcher, was invited to play at Disney’s Epcot Center in Orlando with yodel master, Kerry Christiansen. Kevin and Kerry’s accordionist friend, Herschel Moody, invited me to come out and visit,” Terry said. While there, Terry was asked to audition to work with Kevin and Kerry at Epcot’s German Pavilion. He borrowed Herschel’s accordion and got the job. beautiful place with strong audiences, and have a smiling seamstress at your service,” Terry said. Texans and Oktoberfests across the country are glad he didn’t, though. 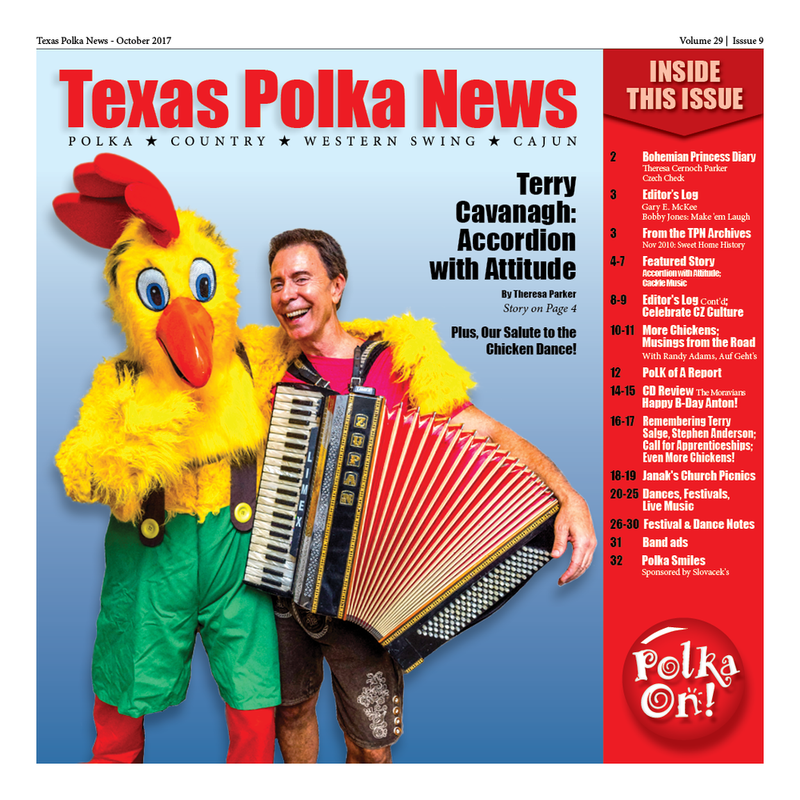 create a band that covered all the bases important for an Oktoberfest – family entertainment, plus more edgy material for late night crowds wanting to dance and party,” Terry said. decades. "This band is all about pure, unadulterated, fun,” Terry said. “People forget their troubles for an evening, let go, and get caught up in the spirit of good fellowship, music, and ridiculous fun." The current band consists of Bill King (clarinet, sax), Jason Jones (trumpet, baritone, Alphorn), Miekki Canales (drums, Hölzerne G’lachter - xylophone ), and Jimmy Shortell (trumpet, keyboard). show leader at Epcot’s German Pavilion. His stage name was Franzie. I chose to immortalize him through Franzie the Chicken,” Terry chuckled. BTW, Terry’s stage name was Ziggy. “You can see that I love Zs,” Terry explained. Isaak had a great time and will reprise the role of Franzie at Wurstfest again this year. “I enjoy making people laugh and seeing them happy. They love seeing the giant chicken walking around. look for when coaching students,” Terry said. "Working with Terry is a lot of fun," Isaak said. "Even during performances he continues to teach me about performing and what goes into making a good show."